Feed Your Artist Soul at the ColorWheel Gallery! Mark your calendars! Re-Purposed Trophies & Awards – Create Cool Trophies & rePurposed Art from Re-Cycled items, vintage charms, collage & embellishments. Guest Henna Artist, Victoria will be offering Beautiful Natural Henna Designs (starting at $10) + our Inspiration Table will be set up with mixed-media materials to Create Art Together! 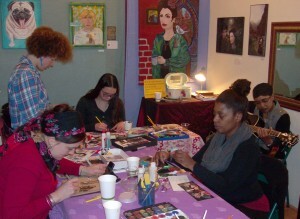 Free art workshop! Sat. October 13th – tickets will be on Sale + the Top 3 winning designs will be on display at the ColorWheel for the month of October!